How would your life change if you created just a small bit of space to encounter God every single day? ​What would be different about you, your soul, ​your relationships, your work? ​What is 30 Days of Abiding? Welcome to 30 Days of Abiding. If you want to take a practical, intentional step in your spiritual journey with God, you are in the right place. The concept of 30 Days of Abiding is simple - practice one spiritual rhythm every day for 30 days. It is a way of creating space for you to encounter God, to listen to his voice, and allow him to transform you. 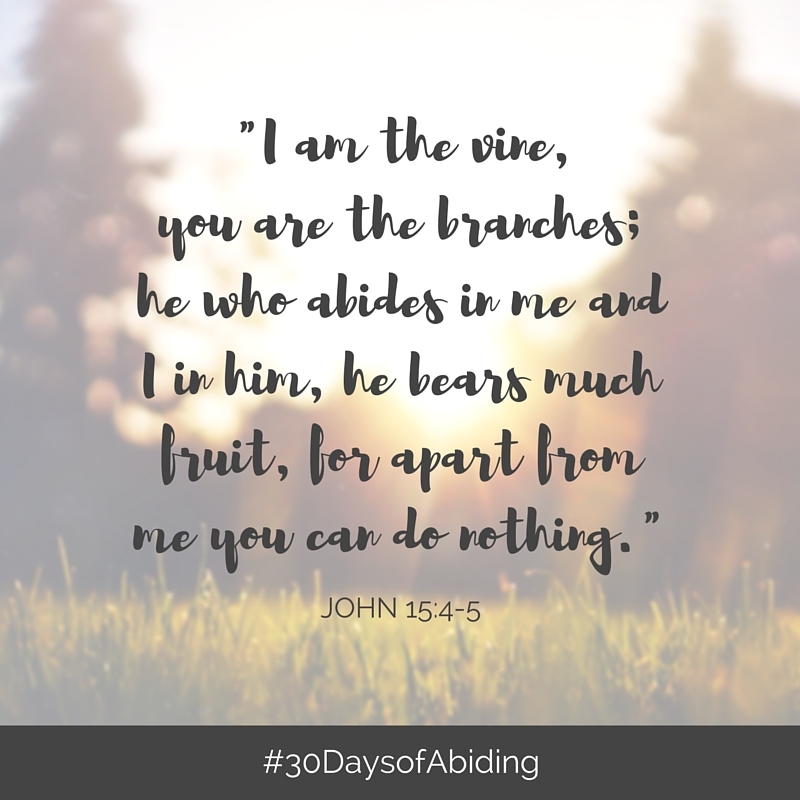 The next 30 Days of Abiding will begin on March 1, 2019, and end on March 31, 2019. ONE: Join The Spiritual Journeyer Facebook group for updates, accountability, and connection with others. That is the primary place where we will be asking questions, learning, encouraging, and sharing with each other. TWO: Sign up for Notes From Larissa for once per week announcements and guidance throughout the project. THREE: Choose one spiritual rhythm you will do for 30 days. Your 30 Days of Abiding can be any one practice that will help your soul connect with God - the Examen prayer, meditate on a particular Scripture verse, spend time outside in nature with God, worship through art or music, list 5 things that bring you joy, etc. FOUR: Let us know what you're doing for 30 Days of Abiding through this very quick survey. FIVE: Invite friends to participate. Can you think of anyone in your life who may benefit from 30 Days of Abiding? Send them the link to this page! You can click on and download the images below as a way of sharing it on social media. ​SIX: On March 1st, begin your 30 Days of Abiding! Use a journal, and write in it each day as a way to reflect and process. If you're on Instagram or Twitter, use the hashtag #30DaysofAbiding so we can all follow along. Note: If you are joining us after March 1, 2019, you can still participate! Join in and catch up, if possible, or begin your own 30 Days whenever you want. Remember: the spiritual journey is not about religiosity or following an arbitrary set of rules. It is about allowing Christ to abide in us, and us to abide in him. It is a deepening relationship with the source of life. As he makes his home in us, we are transformed into Christlikeness and our truest selves. Don't worry so much about achieving a perfect 30 days...just enjoy the process and adventure with God. Larissa Marks, a spiritual director and the creator of Spiritual Journey, wanted to take a practical, intentional step in her own spiritual journey with God. 30 days of something seemed like a good place to start. If you can have space to encounter God and connect with him for 30 days in a row, something good is bound to happen, right? She invited others to join her - including you - anyone wanting to kickstart their spiritual growth, people who are hungry for purposeful connection with others, and those searching for a simple, practical way to encounter God. This is the third round of 30 Days of Abiding. Let's jump into 30 Days of Abiding together, and see what kinds of amazing and awesome things God will do in us!